Home › nostalgia › COMPUTE! Magazine Archives! I love the Internet! I just found an archive of COMPUTE! magazine, which is the magazine that taught me how to program in the 1980’s. Just recently I was lamenting not keeping every single issue I ever had (which was most of them), but now I can flip back through them any time. Looking through the site really brought back some memories of when I first started messing with computers, around 1983 or so. I would run straight from the mailbox to my TI-99/4A (later, it was a Commodore 64) when a new issue of COMPUTE! arrived. Each issue had several program listings that readers could type in and run, usually in BASIC. The really good games and utilities were in assembly language, but these weren’t published as assembly listings. They were page after page of BASIC code consisting almost entirely of DATA statements full of numbers that would get POKEd into memory by a FOR loop. I’d sit and type page after page after page of that, and if I did it right, I could play a game until it was time to turn off the computer and do homework. Then, if I wanted to play it again, I’d type all of that in again, until I finally put a cassette recorder on layaway at Sears so I could store the programs. The cassette recorder was pretty entertaining, too. There was a counter that could be used to keep track of where each program was on the cassette. I kept a sheet of paper next to the computer filled with tape labels and counter positions so I could find all my programs when I needed them. 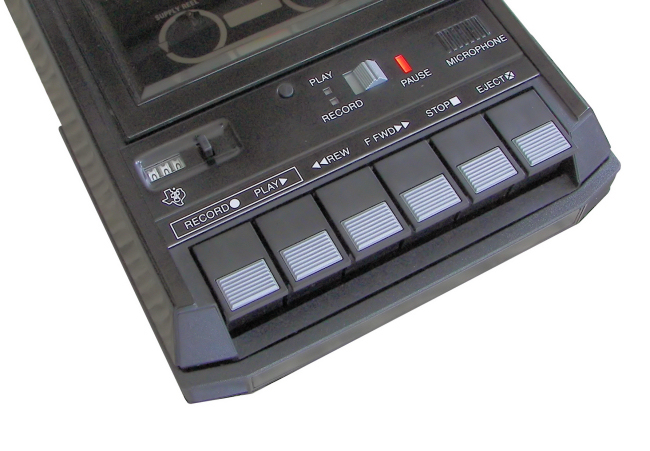 The TI recorder would actually play the bits as audio while the program loaded, and after that I could pop in a music cassette and play it through the TV speakers. That was way before Winamp. Yes, I said “TV.” I didn’t have a computer monitor until a few years later. My gracious parents, who I suppose had decided that I might eventually make a living with computers and move out, would let me monopolize the TV for hours at a time while I drew silly pictures on the screen with my computer. I would sketch, for example, the USS Enterprise on graph paper, split the graph grid into 8×8 squares, convert each row of each 8×8 grid into a hex number, then type those hex numbers into a BASIC program that would draw the picture. Mind you, this was the family TV, back before there were TVs in every room. It sat on a low table in the living room, and I would perch on an ottoman in front of it while I exercised my low-resolution artistic talents. I guess I wore the TV out, because the red component of the picture would flake out after a while, leaving a greenish-blue tint. Ah, the good ol’ days. I don’t miss them at all. That counter was my best friend. ‹ I have a wide screen. Let me use it.